At Sleep On Green our mission is to better our planet one mattress at a time, one person at a time. Our eco-friendly sleep system is designed to provide the purest most natural resting place possible while in-turn giving back to our global community. The natural elements used to create Sleep On Green products are meticulously chosen to help reduce our carbon footprint. Inspired by Italian design, yet Globally Embraced; Sleep on Green has created the most innovative, environmentally friendly mattress by combining specific elements from around the world. Without compromise, the combination of these natural elements is what separates Sleep on Green from any mattress on the market. 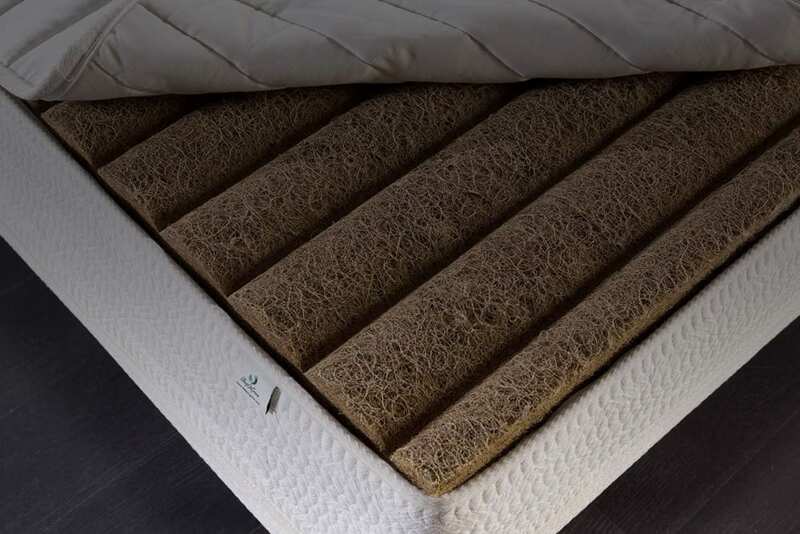 Manufactured in Italy, the mattress is made from Mother Nature’s purest natural elements – Pure Wool, Organic Cotton, Organic Coconut Fiber, Natural Latex, and Organic Tencel Fiber. With over 20 years of research and development, the Sleep On Green team of scientists have worked to develop a mattress that is a healthy alternative to the chemical filled mattress that we sleep on today. With our team’s knowledge and dedication, we have created a mattress that truly strengthens the immune system by allowing the sleeper to live in harmony with the forces of nature. A little background on how our company was started..
On Memorial Day weekend 2007 I was involved in a motorcycle accident, I broke my back and was bed-ridden for months. I had recently purchased a memory foam mattress and it quickly became apparent that I needed a natural sleep solution that would not only give my back the proper support but also prevent hot sweats, boils and bed sores. Our family business had been importing of goods from Italy since we migrated to the US in 1987, immediately we tried some “Natural” mattresses from different manufacturers in Europe but nothing was exactly what we wanted so the next logical step (or not so logical) was to create something, and so it was. With 30 years of background in home furnishing and design my father Fidenzio Bizzotto set off to create a mattress that was breathable, holistic, hypoallergenic, and resistant to mold and mildew. Combining his expertise with a veteran team of sleep specialist, the organic and biodegradable Dolce Vita mattress was born. Fidenzio immediately made it his mission to to have the product manufactured so that he may share his life changing product with the rest of the world. With months of traveling and research he found what would become the perfect team to produce the fine handcrafted Sleep On Green mattresses we see today. Fidenzio’s partnership with a 40 year old company rich in the tradition of hand making fine beds with a fresh perspective and fresh identity to match his new mission would revolutionize the bedding industry by creating the award winning Sleep On Green sleep system. At Sleep On Green our mission is to better our planet one bed at a time one person at a time. Our eco-friendly sleep system is designed to provide the most natural resting place possible while in turn giving back to our global community. The natural elements used to create Sleep On Green products are meticulously chosen to help reduce our carbon footprint. Made from Mother Nature’s Purest Elements. Sleep On Green believes that Mother Nature offers the best ingredients, free of all chemicals. Natural ingredients allow for better health, better sleep, eco-friendliness and mattress longevity. Conventional mattresses use synthetic fibers and harmful chemicals. Synthetic Latex and memory foam make your mattress non-breathable, meaning sweat and moisture has trouble evaporating from inside the mattress. Moisture inside the mattress will often deteriorate your mattress and cause many health risks. Greater Miami & The Beaches Hotel Association along with TripAdvisor awards Sleep On Green as 2013 Green Product. The Greater Miami and the Beaches Hotel Association’s Sustainable Hospitality Council was created to advance the awareness and adoption of sustainable practices by providing guidance, expertise and resources to Association members. 2011 Best of Boutique September 13-14 - Hospitality Design (HD) magazine is pleased to announce this year’s Best of Boutique (BOB) Winners. Entries were received in categories ranging from lighting to outdoor furniture. This year’s BOB judges were Katie Miller, product design director, Clodagh Design, and Barry Richards, principal and studio leader, Rockwell Group. Each winner and honorable mention will be honored with an award to display at their booth, and all of the winning products will be showcased in the October issue of HD, as well as on their website. 2011 New York, NY - The Awards recognize best new products within the categories of design, equipment & supplies, guest amenities, tabletop, and technology, as well as an eco-friendly equivalent to each of these categories. Editors from leading hospitality trade publications reviewed nearly 150 submissions of the latest products for the industry, and selected winners based on innovative product design, how a product answers a particular industry need, creative use of material or construction, and development or use of a new technology. November 2010 New York, NY - The Awards recognize best new products within the categories of design, equipment & supplies, guest amenities, tabletop, and technology, as well as an eco-friendly equivalent to each of these categories. Editors from leading hospitality trade publications reviewed nearly 150 submissions of the latest products for the industry, and selected winners based on innovative product design, how a product answers a particular industry need, creative use of material or construction, and development or use of a new technology.